MUMBAI: Indian music industry and Bollywood witnesses releases of film songs as well as singles that drop almost daily on YouTube. 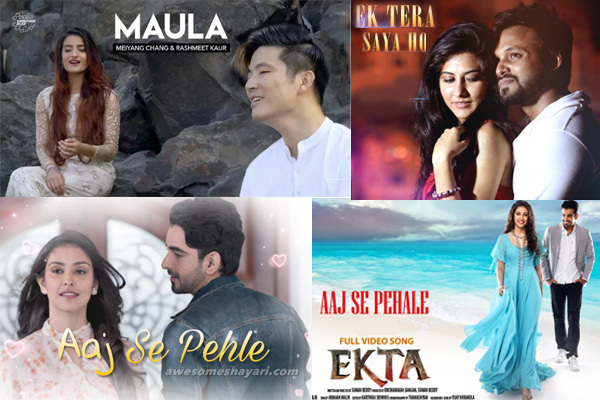 While there are many like Armaan Malik’s Ghar Se Nikalte Hi, Neha Kakkar’s Oh Humsafar, Badshah’s Buzz with Aastha Gill and the rapper’s latest singing debut, Tareefan etc. that have garnered million views in a short time, there are some soulful numbers that went noticed amid the crowd of these famous numbers. Let’s have a look at the melodious songs that are soulful, yet not famous! This Sufi number by Meiyang Chang and Rashmeet Kaur didn’t get much attention. This song crooned by Manish Sharma has received mere 4 lakh views owing to the T-Series label. But, the song still has vanished in the crowd of latest hits. The song is from the upcoming 2018 film, EKta, starring Robin Sohi and Navneet Kaur Dhillon. This song is a beautiful cover of the original song, Yeh Haseen Wadiyan, sung by and featuring Meiyang Chang and Himani Kapoor. Tere Saath is a romantic number sung by Amrita Talukdar and Sumiit. It features Mayur Verma and Saloni Shah. Waada is a 2017 romantic composition by Tony Kakkar starring Imran Alam and Iftesham Siddique. Rafta Rafta, which is a continuation of the romantic series of cover songs sung by Meiyang Chang and Himani Kapoor, is another recent song that went unnoticed though a beautiful number. This song by Sam and Faraz didn’t get much views post its release last month. Inspired by a true story, Tera Chehra is a beautiful creation that actually requires promotion. Produced by Zee Music Company, Dilbar featuring Malobika Banerjee is a fresh song that didn’t get a place in the top chartbusters in spite of its melodious beat. MUMBAI: Tony Kakkar, who has grabbed eyeballs with popular songs like Coca Cola Song, recently performed at the recently held YouTube Fanfest in Mumbai. He had a surprise set planned for his dedicated fans.